Kitting & Light Assembly services - Coast to Coast to Coast Fulfillment, Inc.
Kitting is the process of assembling separate related products into a package, or "kit". 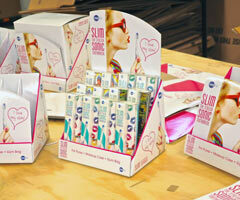 A kit can made for use by a consumer, for retail stores, or for promotional uses. Coast to Coast Fulfillment is a kitting specialist, based in the east coast of the USA. One example of a kit would be a combination of an electronics device, its remote control, an AC/DC power supply, and an instruction booklet. Each of these four components might come from a different supplier, but could be assembled into a kit in the USA at Coast to Coast Fulfillment. Another kit example might be a retail countertop display in which the display's components would be assembled before the merchandise is inserted to complete the kit. component and collateral material packing into a "kit"
Store display prepared for kitting. Display dividers prepped for kitting. Display supports prepped for kitting. Products picked (selected) for kit. Completed kit: Violife store display.